There's my favorite cabinet again. Everything looks fantastic. I love how bright and cheery your house is. Love it all. The colors are perfect. It's beautiful, Heather. Love your dishes and the corner cabinet. So pretty! I love it. It just makes me feel so springy and happy and good. And the lettuce majolica is very cute with the bunnies! Funny! Your house looks just lovely. Beautiful Heather! You are ready for Spring! Love the bunnies! Beautiful Heather!!! I love those cabbage leaf dishes!!! 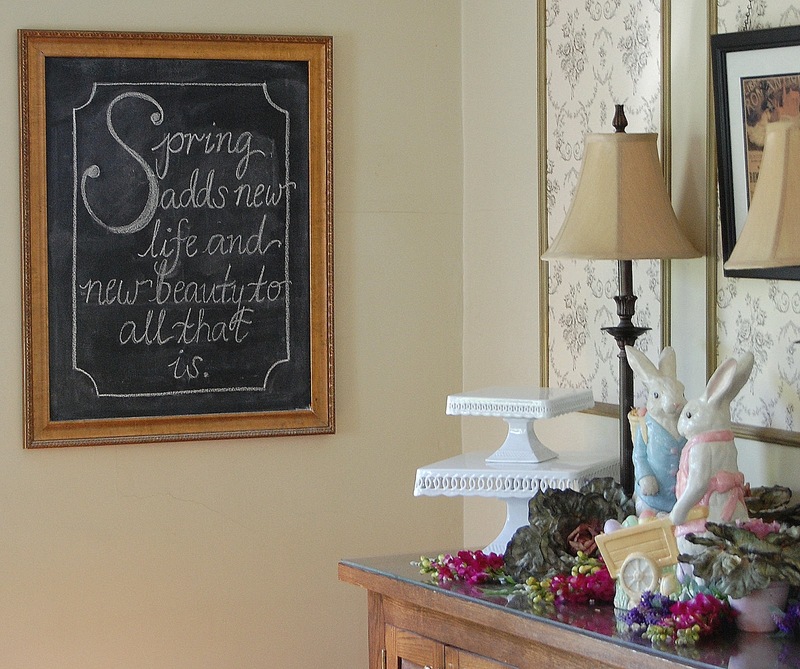 The bunnies are adorable and the quote on the chalkboard fits in perfect!!! I've put out a few things here and there ~ mostly bunnies and eggs! this all looks adorable...love the green dishes and all the bunnies. The quote is great, perfect for the season. Very, very cute. Your cabbage dishes are just spectacular. I always look forward to seeing how you decorate your corner hutch. Beautiful (as always). You already know the depths of decorations at our house. Each holiday is embraced fully. Your corner hutch looks so fresh and pretty. I just love the banner. Heather, I always love when you decorate that cabinet. It looks beautiful and I love the bunnies. I only have one little Easter plate on a plate stand in my foyer. That is the only thing I have out for Easter. How sad. But my kids are going to my mom's house on Saturday to color eggs. At least we will have them in a basket. Everything looks wonderful! 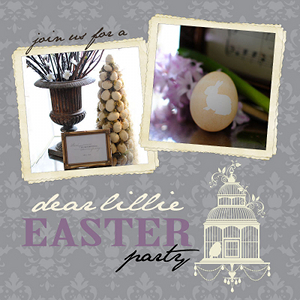 I am a bit behind in decorating and I am entertaining for Easter so I need to get busy, I hope to get some done tomorrow. We share the same chairs - your's are seating at a much prettier table though - mine are saying "hey, what's up with this?" I have a couple of bunnies but they need a nice bouquet!! Enjoy the weekend - zoom around a few blocks in the sweet car for me, okay? I think I'm skipping the Easter decor this year, but you never know. I might pull something out at the last minute. I love how you can write so perfectly on the chalkboard. I look like a 2nd grader tried to write something when I try to get all pretty on mine. Everything looks fabulous. 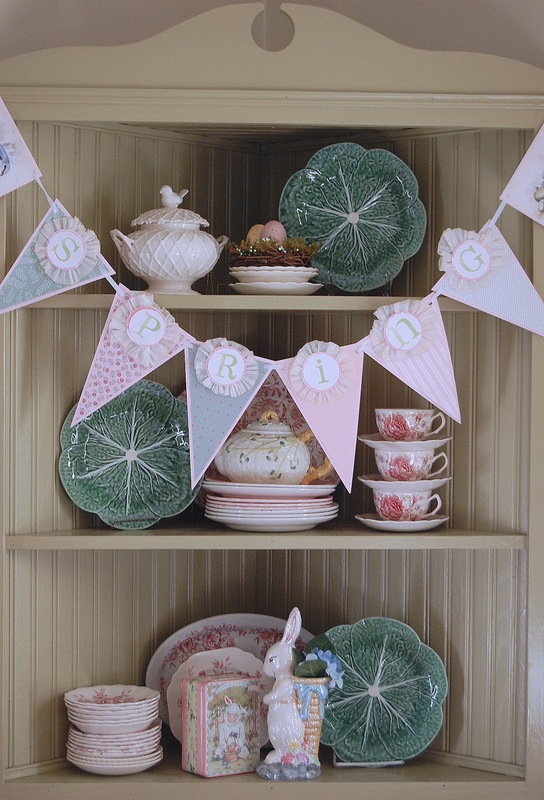 Your cabbage plates are perfect with your Easter decor. Can you believe Easter is in a week? How time flys. You know how much I love your little corner cabinet and always look forward to your seasonal decorations. Looks beautiful...Love, love, love your sweet little banner too. Oh and I got a little glimpse of the framed wall paper behind your sideboard. Did you do that? It's gorgeous...Maybe you could share how you did it? :-) Hope you had a wonderful weekend and wishing you an awesome new week. Gorgeous as always! I always love to see your hutch. And your chalkboard! Oh my! Awesome. Gorgeous, love the chalkboard, its all just perfect. How pretty! I love the Spring banner! So cute! 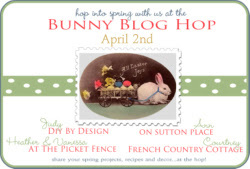 Thank you so much for linking up to our Bunny Blog Hop Heather! I love the banner and the green dishes are so fresh. That little tureen with the bird on the top is adorable. Happy Easter to you and your family! It's adorable! Love the banner and the bunnies! The pink and white color is so springlike and fresh! Very pretty! 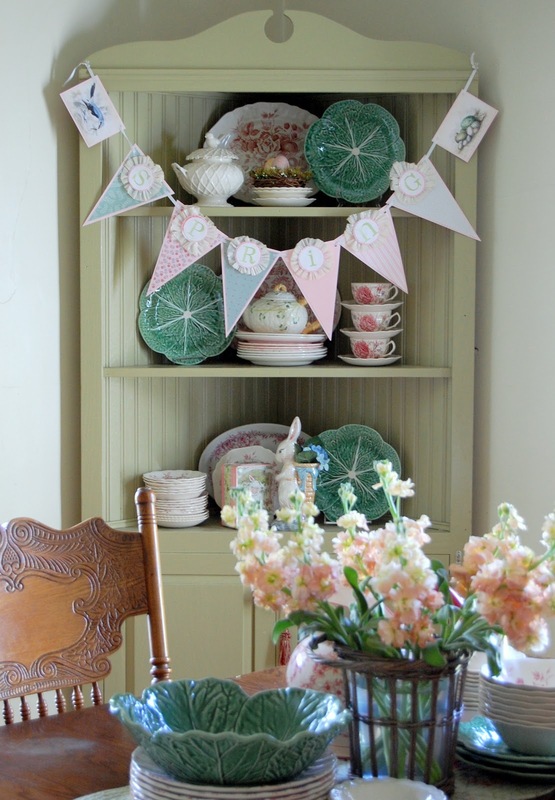 The bunting is charming and the dishes, too. I'm with you on packing things up before they get dusty! Love it all - especially the chalkboard! Happy Easter! Love the way you decorated your corner cabinet with the transferware and cabbage plates. Green is my favorite color, so you know I'm loving your paint color choice. Hope your Easter was great...your decorations are so cute. Visiting from the Bunny Blog Hop. My mom wants to know where did you purchase mr and mrs. bunny? She really likes the bunny statues. She likes them a lot actually.